In June 2015, Pope Francis released a papal encyclical entitled Laudato si’ (Praise Be To You), a rallying cry against the exploitation of the environment. Many, especially in mainstream media, hailed this as a turning point for the Catholic Church, a move toward more progressive and contemporary ideals. 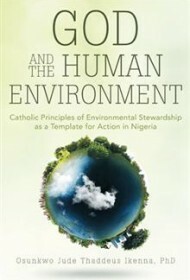 But as becomes apparent in the early pages of Osunkwo Jude Thaddeus Ikenna’s superb God and the Human Environment, the Catholic Church has been a proponent of stewardship, or the responsible safekeeping of human and natural resources, for well over 100 years, dating back in many ways to Pope Leo XII’s encyclical Rerum Novarum in 1891 and later in the writings of St. Pope John Paul II and Pope Benedict XVI. Publishing on the heels of Laudato si’, Ikenna, a Catholic priest from Nigeria, has provided a scholarly, yet highly readable, summation of the Church’s beliefs on the environment as well as arguments on how those ideals can help his homeland. Giving new meaning to the adage, “Think globally and act locally,” the author attempts to link “the Church’s environmental principles to concrete environmental practice, in an effort to enlarge the discussion base to the socio-religious, socio-political, socio-economic and health realms in order” to protect God’s creation, especially in Africa. He succeeds, by masterfully exploring the scriptural and theological ideas about the preservation of creation as well as turning a critical eye on environmental degradation in Africa. Along the way, he proposes actions that could possibly halt the destruction of the land (for example, Ikenna notes that while local leadership in Nigeria is often suspect, the Church still has credibility and needs to develop an environmental catechesis, or instructions of beliefs, on how to preserve life in all its shapes and forms). Well-argued, expertly footnoted, and eye-opening, God and the Human Environment, is a thought-provoking synthesis of theological ideas that, if embraced, could have a positive and lasting impact on the world at large.